reflection of the Creator-God. That is certainly true. Function: This approach sees the image of God in us in the things we are capable of doing, particularly our ability to be imaginative and employ our creativity. Substance: This approach sees the image of God in usas a part of our very essence. It is from this view that we gain the notion of human dignity. Relationship: This approach begins with the Triune God and sees the human longing to be known and loved as part of this desire and capacity for community. There is truth to each of these ways of speaking of the image of God in humans. But there is another way to look at this. The Swiss theologian Karl Barth begins and ends his theology of the imago Dei with Jesus. For Barth, any discussion about our being in the image of God must begin with the recognition that Jesus alone is the perfect image of God. When we want to know what it looks like to be fully human, we look to Jesus. Jesus shows us how we were created to be. This has resonances with C. S. Lewis’s famous words about Jesus being the only truly and fully human the world has seen since the first man and woman. The rest of us are “sub-human.” So, when we fail, Lewis remarks that this is not because we only “only human” but because we are less than human. To be created in the image of God, then, is to be created to be like Jesus. Jesus to lead my life the way He would lead my life if He were me.” It is the imago Dei that makes us capable of living and loving and giving and forgiving like Jesus. What About Sin and the Fall? obscured (Eastern Orthodox?) or obliterated (Reformed? ), we have lost the capacity to be fully human, to live out the imago Dei. PARTICIPATION: What Does This Mean For Our Technology? This fallenness has implications for how we use or misuse our technology. Hide our flaws (Genesis 3): Yes, I’m talking about the leaves Adam and Eve used to cover their nakedness. Abuse others (Genesis 4): Think of Cain murdering Abel, perhaps with an instrument, or at the very least, a certain kind of knowledge of how to do violence to another. The narratives from Genesis 3-11 are a whirlwind tour of the fracturing effects of the fall. In Genesis 12, the Story slows down as God begins His plan to work His salvation into our world by calling Abraham. But right away, we see humans using their knowledge, instruments, and machines to hide their flaws, abuse others, and ascend to the heavens. How do we do the same thing with our knowledge, instruments, and machines? I think of how we manage our image or our “brand” via social media, hiding our flaws and covering our shame. I think of how a podium becomes a “bully pulpit”, and a microphone becomes an instrument to beat others down with words. I think of how our lights and smoke and music can simulate a spiritual encounter or manipulate people into a response, making us think we have ascended to the heavens and reached God for ourselves. Is there a way out? Is there a way to properly use our knowledge, instruments, and machines? How Did Jesus Use His “Technology”? The Greek poieo shows up only twice in the Gospels in reference to Jesus “producing something material”(According to BDAG— the most comprehensive lexicon of New Testament Greek words that we have). Both instances are in John’s gospel. The first thing Jesus made was a whip to drive out the money-changers. That’s a sermon in itself! But the second thing that Jesus, the God-man, the one who was with God before the world began, “through whom all things were made”, made was…mud. In Jesus’ hands, even spit and mud can be used to make blind eyes see. This whole story is about Jesus’ ministry to bring sight to the blind. Later in the chapter, it becomes a metaphor for spiritual blindness and sight (John 9:39). 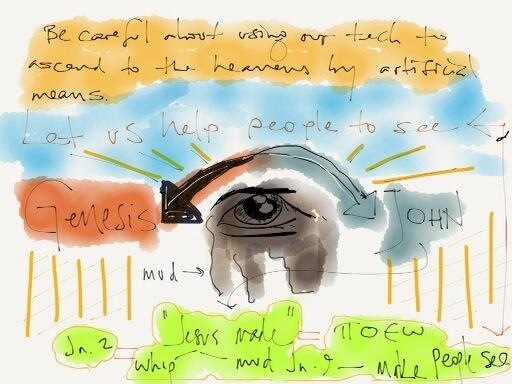 How Can We Use Technology in Our Churches to Help People See Jesus? Some of us may have tools that may seem like little more than mud, but in the Lord’s hands, they can help blind eyes see. Jesus takes and uses in the gospels: bread and wine. Luke shows Jesus taking, blessing, breaking, giving three times– at the feeding of the five thousand, at Passover, and at the home of the disciples on the road to Emmaus. And it is at their home, after Jesus takes the bread, blesses it, breaks it, and gives it, that their eyes are opened. They begin to see Jesus…for the very first time. Graham suggests that all technology has an outward form that has to do with its utility and an inward form that has to do with its beauty and mystery. No, that doesn’t mean that technology become a means of grace the way the Sacrament is. 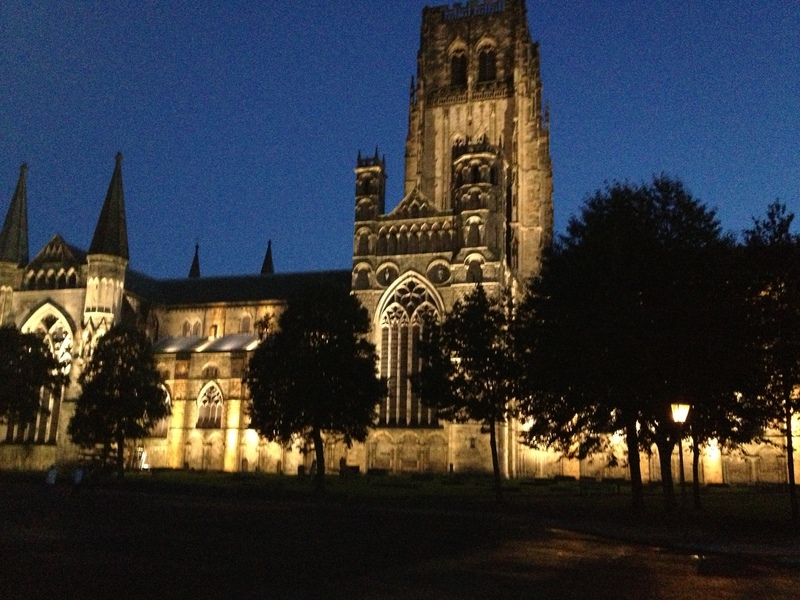 Last month, I was in Durham, England, and got to see and worship in Durham Cathedral, built a thousand years ago. The building certainly has a utility to it; it is made for people to be in. But it was designed with more than utility in mind. It was made for worship. There is a beauty and mystery, a sense of awe and wonder that is awakened as soon as one enters. May we place our knowledge and instruments and machines in the hands of Jesus so that He can use it to open the eyes of the blind. We are in this to help people see..to see Jesus.